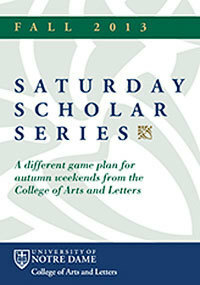 The 13th annual Saturday Scholar Series promises an intriguing lineup of lectures by leading faculty members on each home football game weekend this fall. Cyril O’Regan, Catherine F. Huisking Professor of Theology; and Kathleen Sprows Cummings, associate professor in the Department of American Studies and director of the Cushwa Center for the Study of American Catholicism. Sept. 21 “Letting Go: From Ancient to Modern Perspectives on Relinquishing Personal Control” with Thomas Merluzzi, professor in the Department of Psychology and director of the Institute for Scholarship in the Liberal Arts. Sept. 28 “Dante and the Birth of Modern Literature” with Zygmunt Baranski, Notre Dame Professor of Dante and Italian Studies in the Department of Romance Languages and Literatures. Oct. 19 “Implementing Social Change: A Collaborative Design Project in South Africa” with Robert Sedlack, associate professor, director of graduate studies and associate chair in the Department of Art, Art History, and Design. Nov. 2 “The Chapels of Notre Dame” with Lawrence Cunningham, John A. O’Brien Professor of Theology Emeritus. Matthew S. Holland, president, Utah Valley University. Originally published by Arts and Letters at al.nd.edu on July 26, 2013.